Jelly rolls take the guesswork out of quilting; at their most basic, they're long, narrow strips of fabric used as binding or sashing on quilts. Jelly rolls are also used to make strip quilts; just sew the strips together, attach batting and a backing, and you have a quilt. Pre-made jelly rolls can be expensive and don't always suit the project you have in mind. Making your own jelly rolls can cut down on the expense of quilting, give you more creative control over your finished project, and help you use up fabric scraps you have lying around your sewing room. Wash and dry your fabric; any shrinkage that occurs happens during the first wash. This ensures your final project is of a uniform size. Iron your fabric. Ironing your fabric ensures that it lies evenly and crisply, allowing you to cut your jelly rolls into uniform strips. Lay your fabric out on your work surface. Smooth out any wrinkles or uneven spots in the fabric. Measure a strip of fabric 2 1/2 inches long by 45 inches wide, the length of the fabric. Mark with tailor's chalk. Measure and mark 40 total 2 1/2-by-45-inch strips of fabric. Cut all 40 strips using your rotary cutter. Press the rotary cutter to the fabric and glide the wheeled blade along the fabric. Use a cutting mat to avoid damaging your work surface if desired. 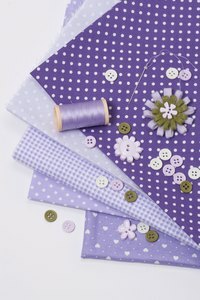 Arrange the fabric strips in a pile with the patterns all facing the same direction. Start at one end of the 45-inch strips of fabric and curl the bundle into a spiral to create the jelly roll. Not all strips in a jelly roll have to be the same fabric; mix and match patterns. Just be sure that all the pieces of fabric are the same width: 45 inches wide. You can use leftover, irregularly shaped pieces of fabric by quilting them together and cutting 2 1/2-by-45-inch strips from the quilted sections. Rotary cutters are sharp. If you're not used to working with one, cut slowly and observe basic safety procedures such as keeping your fingers out of the line of the blade to avoid damaging yourself.